You don’t need any special qualifications to become a yogi. You don’t need to be part of an exclusive caste, club, or group. You don’t need to drop your current life and relocate to a hermit’s cave. All you need to do is start where you are. Lahiri Mahasaya, the great kriya yogi, had an office job as an accountant and later was posted at a mountain military site, as recounted in the epic stories told by Indian guru and yogi Paramahansa Yogananda in his beautiful book Autobiography of a Yogi. It was there that he met his guru, Babaji, and went on the yogic path, creating a lineage and legacy of generations of yogis in India to this day. Every bit of his life had been preparing and leading him to take that journey. He was a regular person living a “regular” life just like you. In my own trajectory growing up in Iran, who knew I would end up on the yogic path as a yogi? I was living a “regular” family life with my mother and father when the revolution and war began in 1979. My mother rushed me out of the country to avoid being deployed to the front lines at the age of twelve. I landed in England, and within a few weeks was placed in a boarding school, even though I could not read or write English. My mother immediately returned to Iran to be with my father. I was on my own, dislocated from home and family, until my parents could find a way to safely leave Iran. I wouldn’t see my father for four years and only saw my mother periodically when she could come and visit a couple of times a year. I continued from boarding school to college for a year and then dropped out and headed to London to try my luck at any job I could get. I was nineteen, and my family was not pleased with my decision; they worried I would stay adrift. However, within a few weeks, while I was walking down one of London’s hippest streets, a modeling agent scouted me. I soon ended up on the catwalks of Paris, Milan, and New York. I traveled the world for twelve years, working and becoming friends with some of the most famous people on the planet and landing exclusive jobs, like appearing in Madonna’s “Express Yourself” music video and being on the covers of fashion magazines like Vogue and GQ. Never in my life would I have guessed I would become a model and be named one of the most famous supermodels of my time. It would seem my life had reached a pinnacle and couldn’t get any better. The life of a supermodel is probably regarded as the most exciting, carefree, and glamorous life anyone can live; you make lots of money and people revere you as a beauty symbol. Life couldn’t get much better on the outside. But what about the inside? What I didn’t know then was that I was at a crossroads, and the next chapter of my life was about to begin. Everything before had been preparation for something beyond my imagination—destiny would lead me to the extraordinary. I had traveled from New York to Cape Town, South Africa, for a fashion show for Versace at Nelson Mandela’s home. Upon my arrival at the hotel, I saw my friends and fellow models Kate Moss, Christy Turlington, and Naomi Campbell, and a few other well-known faces. It was like any other day on the job, nothing out of the ordinary. We were scheduled to meet the president at the Palace Gardens the next day as well as prepare for the fashion show. That morning the atmosphere was both calm and electric as we stood in the receiving line and moved one at a time, as security didn’t allow people to gather around Mandela. When it was my turn, I approached him to shake his hand. To know a person you look at their face; to know their soul you look into their eyes. I gazed deeply into Nelson Mandela’s eyes. I don’t remember what we spoke of; I just remember his eyes, sensing a silent exchange. The gathering was over a few hours later, and we proceeded to a dress rehearsal and fitting. The house of Versace makes high fashion in a very colorful and extravagant way, so I knew it was going to be a spectacular event. I was excited and looking forward to the fun. Later that evening, there would be a private party. When I woke up the next morning, something felt different. I couldn’t place it, but I felt something within coming to the edge of my awareness. Before I could explore any further, I was distracted by the day’s events. The show was amazing, and the glamorous after-party was filled with VIP guests from all over the world. It continued until the morning, and after a couple of hours of sleep, I was on the plane and headed home. Three days had gone by like a flash. Back in New York, I reflected on my time in Cape Town. I recalled all the amazing moments, extreme excitement, beauty, glamour, and fame. And then I remembered meeting Nelson Mandela. Here was a soul who had it tough all his life; he courageously fought for freedom and basic human rights. He went to prison for twenty-seven years and came out smiling. In his eyes that night, I saw that his soul had always been free, although he had spent years in prison. I didn’t see those walls being a hindrance; on the contrary, the prison was part of his soul’s evolution. The prison had given strength to his soul to master a freedom that could not be taken away or lost; it did not control the spiritual freedom he had within. I came to see and understand that this experience of imprisonment and liberation was part of all of our paths—the need to be spiritually free and find our purpose. I had arrived at a crossroads sparked by meeting Mandela and reflecting on his life. From my viewpoint as an observer, I wondered where I fit in. I started to see how on one side, I was living my outer beauty. It was an exciting life and fulfilling on many levels, especially for sensory pleasures. It was a life that very quickly met most of my desires. I thought: Maybe this is why I’m seeing my life differently now. Have I had all my desires met? What more is there to achieve in fashion? On the other side, I felt something more powerful pulling me toward it, but I didn’t know what that journey was yet. All I felt was its undeniable force, which I wasn’t quite ready to surrender to. So what was my purpose? This was the question I was exploring at this new crossroads in my life, and I had to decide which path to take. I decided to alight from the fashion ride at the next stop, but without knowing my true destination. What I was sure about was I needed to get off. I couldn’t control the “wherever,” but I could control the “whenever,” so I took that action right away. I retired from modeling, and after a few years of wandering and searching, I ended up in India training in the sciences of yoga and ayurveda. Ayurveda is the traditional Indian medicine that comes from the oldest books of knowledge: the Vedas. And now, some fourteen years later, I live part of my life as a yogi in a rain forest in India and spend the other part traveling and sharing yogic teachings with people around the world. If anyone had looked into the future and explained to me that this was going to be my life, I might have had a hard time imagining it. Mine is definitely not a common spiritual path! But then again, spirituality doesn’t discriminate against professions or people; it is available to anyone who chooses to follow it. And at times, even if you don’t choose it, the spiritual path often prods until you surrender and do. When I first left Iran, my only wish was to stay with my family. I remember being dropped off by my mother at boarding school in the north of England. As she drove away, just one tear slid down my cheek, and that was the end of my pain. I had a wonderful time at school, and I barely missed my family from then on. Something within me was totally okay with being alone. I had an intuitive feeling that I was taken care of and that things would always be fine. Looking back, I can see how this experience of early separation from my family was preparing me for the yogic life. My past karma (actions) was steering me through what I had to experience as part of my spirit’s journey and purpose. I also learned that it’s best not to expect someone to be solely there for you, even if they want to, because ultimately at times circumstances dictate our situations. Maybe at best we can depend on others to assist, but relying on someone to always be there for your needs is a risk that can steer you outside of your life’s purpose (as well as the other person, who has his or her own life’s purpose). I learned early on to trust the voice from within, although I wasn’t fully conscious of where this voice was coming from at the time; it would become my guiding star to the yogi path. A yogi is quite detached in his being, and this was my training from an early age. I spent a lot of my young adult life alone, focused on my modeling career, until I met Ron, who would become my best friend and spiritual mentor, in Paris. One day in the gym, I saw a man who appeared to be in his forties or fifties wearing a green tracksuit and headband and looking at me with a cheerful, friendly smile. I introduced myself to him, and we started talking like we’d known each other a hundred years. After some weeks of regular chatting, we learned a lot about each other. I found out that Ron had contracted HIV. With my growing friendship with him, a new part of my life began. By day, I was shooting magazine covers for GQ in Milan, doing advertising for Guess jeans and Versace on location in Hawaii, and filming music videos for Elton John in London. But on my days off and at night I was mainly hanging out with Ron. He introduced me to the study of spirituality, guiding me through his own knowledge and experiences. He had me read a diverse range of books on spirituality from the 1960s and 1970s and took me to seminars by Deepak Chopra and Marianne Williamson, when she was teaching A Course in Miracles. At nineteen I was leading a dual lifestyle—model by day, spiritual seeker by night. Then in 1998, I decided to leave the fashion business after meeting Nelson Mandela. When I first met Ron, I would not have viewed him as a mentor. I realized he was more like a mentor to me only after he passed away fourteen years later. While he was alive, he was just my best friend. I remember us walking around Paris all the time hand in hand or arm in arm, chatting away about life. Most people thought we were in a romantic relationship, because they saw me everywhere with this older man. We found this very amusing, and even played it up at times just to keep people guessing. It was fun, especially because I had a girlfriend, which made people even more curious and confused. My mother is English, and most of my childhood was spent in that culture where our “English sense of humor” is just this way. I learned from early on that when a young man has an older gay male friend or teacher, the world will comment, have opinions, and judge, but that was okay with me. It was all part of the process of being both an individual and part of the whole. Ron taught me never to react and to allow others to have their opinions, but always try and live by what was true in me. It was an extremely valuable lesson that has been with me ever since. It allowed me to be comfortable with myself and leave others to be themselves—no judgment, no reaction. Ours was a true and loving friendship between two beings who enjoyed spending time together—it was my experience of a deep and caring friendship. Spirituality and the quest to reach our purpose were our common goals and favorite topics of discussion to the very end of his life. I remember looking into his eyes shortly before he left his body and seeing the same thing I saw in Mandela’s eyes. He was free and had completed his purpose. After Ron’s death, I left Paris and went to New York. I wanted to expand on what we had been discussing all those years, but again, I wasn’t sure how to go about it. Although I had been practicing yoga and living a pretty healthy life, I didn’t think I had been using what I’d learned in a daily practice. I was a casual spiritualist. In early 2003, I trained for six months in yoga teacher training at Integral Yoga Institute in New York. This was a good start to walking the yogic path, but I felt I needed much more knowledge on the subject. I had read a book by Dr. David Frawley called Yoga & Ayurveda, which explains how the two sciences are practiced together according to the teaching of the ancient rishis, or sages, of India. This was my missing link. Frawley says that ayurveda is the science of the body, while yoga is the science of the mind and beyond. This is exactly what I was beginning to experience, and I realized that I needed to go to the source of these two sciences to evolve more deeply on this path. In more than fifteen years of trotting around the globe, I never had the urge to visit India, the land of spirituality. Now I know why: I was not ready to meet my teachers until I had done some prior work to prepare myself for what was to come. Two weeks after I finished my teacher training in New York City, I traveled to India, where I met and went to school under the guidance of my guru, Sri Vasudevan. When I say guru, I should explain that at times it means teacher and at other times it means guide. This can apply to a variety of people in your life, but a guru who is enlightened and can leave the physical body at will is something else entirely. This higher being has given up control in order for his soul to be completely in charge of his body and life, and these are rare beings you will not meet under normal circumstances. My guru is a teacher and guide. I have yet to encounter my enlightened guru and master. This will come at my next stage of spiritual training. I understood these spiritual teachings were not easy to grasp and were even more difficult to put into practice unless I had a guru to lead the way. I also came to understand that the “outer guru” is a reflection of our own “inner guru” that is also teaching and guiding us. The outer guru guides us to the point where we can learn to follow the inner guru. With guidance and years of study and practice, I realized that not only did I want to teach this path, I wanted to devote my life to it and live as a true yogi. This is when I went from “Cameron” to “Yogi Cameron.” After making my commitment, along with receiving more training and guidance from my teachers, I was finally ready and was allowed to teach. I was instructed that it was time to go back to America to share this knowledge with those who wanted to become yogis or to apply these practices to their daily lives. We both knew it was time for me to leave and start to share the practices and knowledge, but my resistance in going back to Western society stemmed from the fact that it was a very extreme and abrupt change of environment and lifestyle. I had already lived the high and fast life as a model, and now I was at the other end of the spectrum, living slow and simple. Going from a small Indian village to the big city seemed to be moving between two extremely different and opposing worlds. How was I going to do this? I was once a well-known model, but that was more than ten years ago, and I no longer had any kind of public presence. Most people outside of India didn’t even know what a yogi was or how he lived. How was a fashion model turned yogi going to be taken seriously? How would people understand? The whole idea sounded a little outlandish, even to an open-minded person. I realized it didn’t matter what other people thought, or what my mind was resisting. I only had to trust in my spiritual practice, my commitment to the wisdom and training I had learned from my guru, and follow my intuition—the yogi within me would guide me on the path ahead. This is when my training moved from theory into practice. The science of true yoga teaches that the longing we feel deep inside is the spirit of cosmic consciousness—the divine spirit, God, universe, or any other name you wish to give it. Yoga teaches us that the separation we think is there only exists in our mind, because our eyes are fixed on the material outer world, which has us mesmerized and distracted. Just like a movie, it seems real because of the visual images, but our intellect knows it is all just an illusion and plays along, suspending disbelief. Therefore, the idea behind spiritual yogic practices is to turn our focus inward, removing the illusion that we only need the outer material world, and instead move into a universe much more immense and endless than the outer world we exist in momentarily. This means true liberation beyond the body, where there is no physical or mental suffering. This liberation from the veil of the material world and its suffering is the inspiration and purpose behind the teachings of The Yogi Code, which have been selected from the Vedic knowledge system. The original ancient texts where yoga and ayurveda come from are called the Vedas, comprised of four vast volumes of work, which are not easy for the layperson to comprehend but are written for the devout spiritual seeker. Within these sacred volumes are all the secrets of yoga and ayurveda, as well as the spiritual laws we need to live by to understand and conquer death. All yogic paths lead from the Vedas and back to them. They are the beginning and the end of all spiritual knowledge. 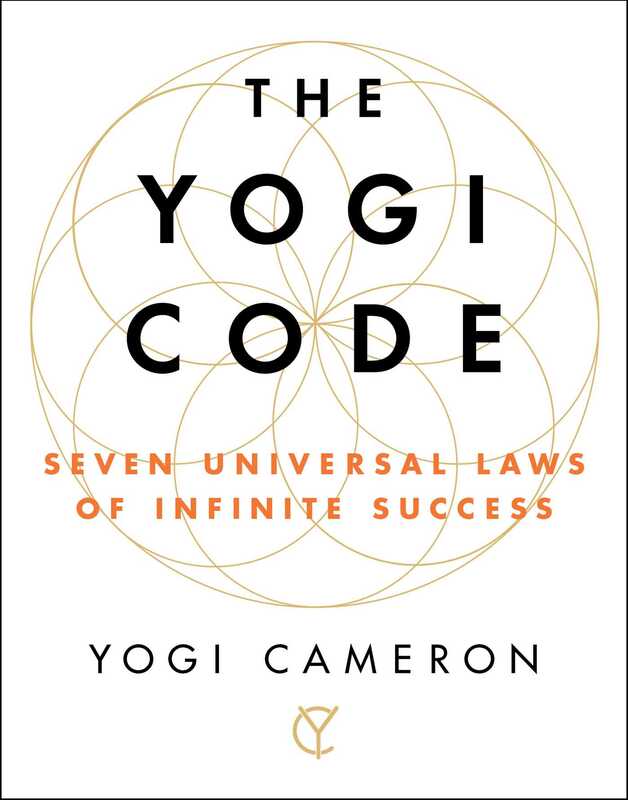 I selected these seven yogic laws or principles especially for the times we live in. We are in the age of technology and speed. People are moving faster, and time seems to be moving more quickly. Everyone seems to need more time, but can’t find it in their lives to reach their goals. More people are struggling with stress or depression or feeling overwhelmed, and are taking a lot of medication to cope. People are lost as to what their purpose is, living in constant overdrive. These modern-day issues, evident for so long in the industrialized world, have been growing more common throughout the nonindustrialized world as well. On a trip to Cambodia, I was speaking to an office manager from a charitable foundation who told me, “We know soda and junk food are really bad for us, but we want to be modern, live modern, think modern, and become a developed country quickly so we are not considered a third-world country anymore.” I saw the same thing happening when I was teaching in China and India. Excess has become the new “normal,” and along with it have come most of our health problems and spiritual confusion. The ancient seers saw and knew the turbulent age we would be living in, so to help us through these difficult and challenging times, they devised practices to help us live with integrity, kindness, and compassion—our higher consciousness. As you learn these yogic practices and make them part of your daily life, you will become a seer and a yogi too. Your point of view, your attitude, and your actions will all become clear, peaceful, and loving. Compassion becomes your nature and joy becomes a way of life. You start to embody truth and leave fear behind. The yogi is a practitioner and eventually a leader on the spiritual path. When we are fixated on the outer world and invest all our time thinking about things such as money, career, relationships, success, and belongings, our minds become engrossed in our surroundings through the senses. In this mental state, we only believe in a material existence, and all other levels of consciousness stay out of reach or unknown to us. Our society is focused on machines and technology, thinking the more we see progress on these material levels the more we are advancing as humans. But we need to look back at our progress so far. Have we been able to live peacefully, lovingly, or kindly with others and the environment for the last five thousand years? We are advancing by leaps and bounds on the technological front, but on all other levels of humanity and spirituality, we are sinking deeper and deeper into an abyss of ignorance, cruelty, and fear, trying to protect ourselves from the “enemy”—namely other people. The only real enemy is the fear we have created inside our minds. It’s time to shift our focus from the material world and end our self-inflicted suffering and stress. It’s time to return to that from which we came, the cosmic consciousness of our universe that connects all beings together. We can either come together, being our most loving and compassionate selves, or we can continue to live disconnected and in fear of one another, pointing out our differences such as race, religion, sexual orientation, and political views. One path leads to liberation and purpose on the highest level, and the other keeps us stuck exactly where we are, on a much lower one. It’s time to choose your path—no one can exist on both. We read a lot about successful people and their life stories, their struggles and their ups and downs. But usually there is a common thread in how they made it: a lot of determination and persistency in their dreams and beliefs. We live in a world where we define successful people as the ones who build empires and companies that are worth billions. They are people who hold world records and win championships, who have fame and wealth, who have gone beyond the ordinary and become the few celebrated ones. We also recognize others who have overcome disease, disability, hardship, or extreme struggle through poverty or addiction. These are examples not necessarily of successful people, but of inspirational people, people we look up to who never gave up and overcame the odds. But it isn’t often that we think about being healthy in body, mind, and spirit as being successful. We don’t associate having a balanced and calm mind as successful, or being healthy as an accomplishment. There are no special contests or awards for this. But not getting sick and keeping a healthy body and mind is the backbone of any spiritually successful person. Can a person go to work, tend to their children with a healthy attitude, be of use to anyone if they are sick in bed? Our health on all levels of body and mind needs to be protected and preserved through a healthy lifestyle in order for us to achieve everything else we want to achieve in this lifetime. From the yogic prospective, a person who has health in body, mind, and spirit is the true definition of success. To help you achieve this level of health and well-being, this book offers seven universal laws that, when followed and applied to your life, will guide you to become the most successful person you can be. Why is this? Because the success I’m defining is not limited to material, exterior success, which everyone puts so much emphasis on. This is often the most basic level of success: make a lot of money, have your desires met, and make your mark on this world. We have endless examples of people doing this. But what we don’t have much of is balanced beings living in a healthy body and a peaceful mind, with spiritual purpose. This is the promise and outcome of dedicating yourself to these practices. And once you have achieved this level of abundant success, how do you maintain it? So much emphasis is put on becoming successful and reaching our highest potential, but little is taught about being able to sustain this level of success. This is what you will learn as you work with these seven universal laws. So when life is not going your way, when challenges strike, instead of feeling lost and confused, you have the resilience and fortitude to feel complete and to keep moving forward without being distracted by your fears. 1. Routine: This defines the way you live each day. 2. Practice: This gives you the tools to develop a unshakable spiritual foundation. 3. Self-study: This gives you the knowledge of who you really are and not who you have become. 4. Intention: This unearths your deepest desires that lie in your soul, which may be different from your spoken intentions. 5. Purpose: The biggest question anyone can contemplate; even if you gain everything you ever wanted, if your purpose is not lived, you feel an inner void. 6. Service: Cultivating an attitude of serving others and the world in all that we do and say brings a level of spirituality to our lives that is not reached through any other means. 7. Love: The culmination of all the other six practices will lead to a true, everlasting, and uninterrupted flow of love’s energy; to experience this love, the mind will need to surrender itself to a greater awareness within. This is how the essence and purpose of the yogi is unveiled over time. To discover the bigger truths and higher meaning of your life, you have to uncover the secrets to spirituality and live them through daily practice. The spiritual path is at times called a secret because it is hidden from the one who doesn’t have the code to unearth it yet. To get to our higher inner power we need to practice continuously without distractions and for a long time. In other words, we need to practice daily and make it a part of our lifestyle. Often people ask me if I think they are spiritual, while others tell me how spiritual they are. Everyone relates to spirituality, but people don’t always know how to connect to it. After all, telling people there is a universe within them is a nice thought and sounds like a beautiful idea, but to actually make it a reality as a self-realized experience takes practice. This is the level of the process that fewer people ever reach, but those who do are living with a different quality of life beyond the material or mental levels. This is where the universe of spirituality opens, and the “outer universe” appears so insignificant in comparison. You can be any kind of person—a felon or a saint. You can be a model or movie star. You can be a CEO or a politician. These are only job descriptions and not what is under the skin of the individual—the soul. Spirituality is connecting with the soul and knowing your purpose—this is where life goes from ordinary to exceptional.